George Grund is a native of Bethlehem, PA and now resides in Hellertown. He began studying piano at the Bethlehem Conservatory at age 7 and began clarinet and saxophone at 10. George graduated from West Chester University in 1975 with a B.A. in Music Theory, and has been a freelance musician in PA, NJ, and NY. From 1976-1981, he served in the 399th and 3rd Infantry Div. Army Bands as instrumentalist and arranger. From 1993 to 2008, George was the pianist for the Rob Stoneback Big Band. 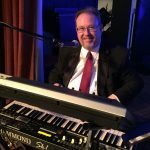 Over the years he has also performed with the Coasters, Drifters, Ben E. King, Lee Oskar, Lisa Simone, Sterling Koch, the Buzz Jones Big Band, and the Glenn Miller Orchestra. For 8 years in Arizona, George performed with many of the top jazz musicians in the Phoenix area and the popular band Flipside-45. He has again begun his musical activities in the Lehigh Valley, playing with Joe Mixon, GT-3, and Fusion Jazz Trio.